A palette of earth tones define this dramatic beaded necklace and dangle earring suite. The beaded necklace is composed of picture jasper, lava rock and hematite, vermeil spacers beads and a jumbo spring ring clasp. It measures 19 inches long and may be shortened. 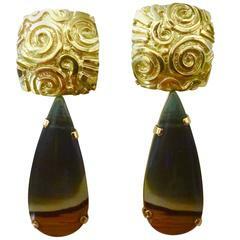 The dangle earrings are created with a combination of smokey quartz, citrine and drusy quartz. The handmade settings measure 3 inches long and have posts with extra large friction backs. A classic Tanzanite beads necklace, comprising of 567 carats of Tanzanite beaded in 9 strands. Clasp is made out of silver. Certificate can be provided upon request.